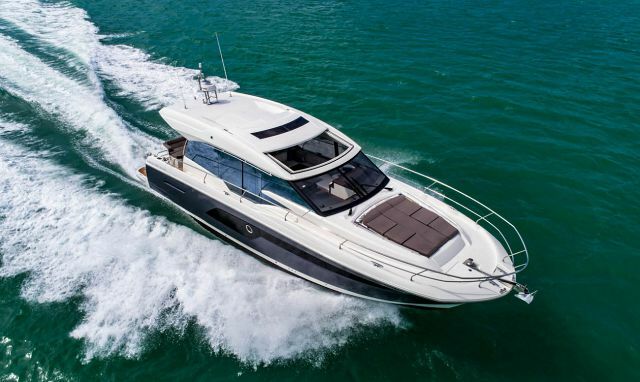 Viking Yachts' new 58 Convertible is the second generation of the model. Find out how this version is different from the original 58C. "Right from the beginning the philosophy, design, and engineering was lean (and) efficient really, were two big words surrounding the whole principal of getting the boat developed early on. Now everything is foam, balsa core, and a lot more foam, actually. So a lot of advancements there where we were able to add core, change laminations, get some weight out of the boat in the FRP products. Being an engineered and design driven company, that has really grown quite a bit," said David Wilson, Viking Yachts Design Manager. There has been a lot of excitement and intrigue around the new Viking 58 Convertible which will make its debut at the upcoming Fort Lauderdale Boat Show. With one of the top design teams in the world and the most advanced boat building factory assembled in the U.S., when Viking launches a new model people take notice. The original 58 convertible that first debuted back in the 1990's was a phenomenally successful model selling over 100 units at the time. 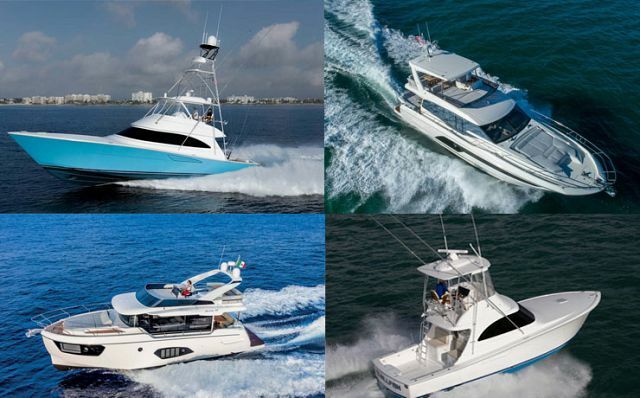 There have been many evolutions in boat design, materials, and construction since the first 58 was splashed, even just starting with the inclusion of a Seakeeper Gyro. Cockpits have gotten larger, fishing equipment on board is more advanced, and the interior accommodations have certainly grown more luxurious. If this is your first new Viking purchase, we suggest you take a moment to read our article "Your Resource Guide To Owning A New Viking Yacht." David Wilson was on the design team back when the original 58 Convertible first launched. "I'd say the philosophy was similar," he said when asked about comparing the first generation 58 to the new model. "We can talk about the attention given, and that the lean and efficient philosophy is greater now. But I think what Bill (Healey) started back then in that generation we applied really that same effort. You know the team that built that boat, a lot of us are still here....Form the beginning the philosophy driven from Pat (Healey) on performance and speed was efficiency. And with that, we were slated with 10-cylinder engines. We were given a speed of 41, 42 knots and that's what we had to achieve." Good luck finding a fighting cockpit this big and as decked out on a sub-60 foot sportfish. Measuring in at 165 square feet thanks to a 18'+ beam, the cockpit has plenty of room for a crew to move around an angler in the fighting chair, the rod holders, and outrigger lines that may be in the way during a tournament. 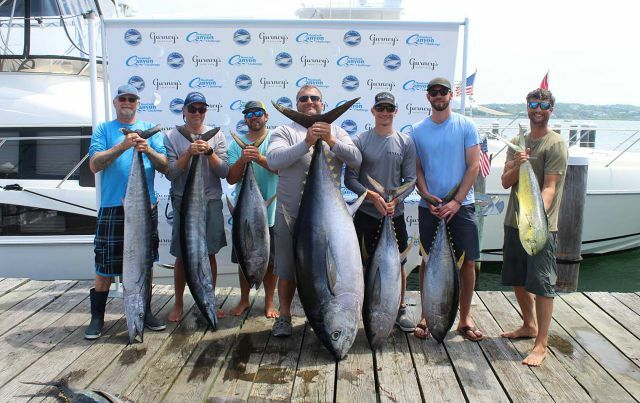 When a big Marlin is on the line, seconds can count. You don't want your crew running into each other and getting tangled up. The 58 Convertible does a good job keeping the cockpit area spacious and hiding things like livewells and storage. And you absolutely cannot beat watching the action unfold from Viking's signature observation mezzanine. 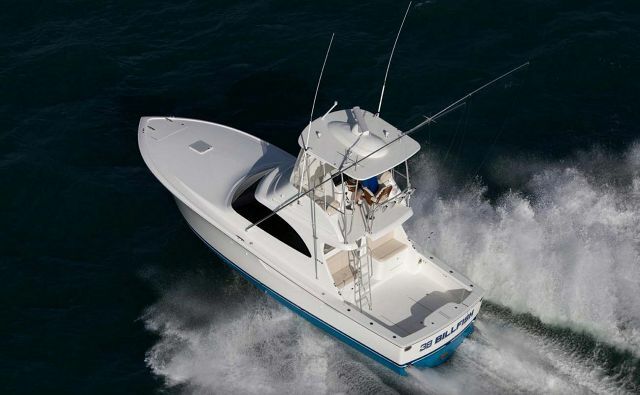 Viking moved away from the traditional sportfish upper helm for this center-line design that is efficient for the captain and provides great visibility. The command station has plenty of room to walk around, the electronics are within reach without stretching, and it is equipped with power-assisted hydraulic steering, single-lever electronic controls with station select and keypad, and electronic trolling valves. Anyone riding up top with the captain will love the cushy helm seat as well as the lounges that are port and starboard on the bridge. The interior of the 58 Convertible is very similar to her larger siblings, the 68C and 72C, in terms of layout, high-gloss finish, big windows port and starboard, and the Corian countertops. The 58C has a center-line walkway which makes moving from the aft cockpit to the bow of the boat very convenient. The lounge seat is an L-shape which is great for socializing at the end of the day and there are hidden storage compartments everywhere. There's nothing better than after a long day fishing in the sun to come and rejuvenate yourself in front of the entertainment center with a nice meal prepared in your full galley. Extended, overnight trips on the Viking 58 Convertible are not only manageable, but very enjoyable! The master stateroom is huge for this size of boat and is placed on portside. It features a queen-sized walk-around berth with storage under the mattress as well as in nightstands, hanging lockers and other areas. The master suite has an en suite head, while the other two staterooms share a head. The VIP cabin is placed in the bow and can be outfitted with either another queen-sized berth or over-under bunks. 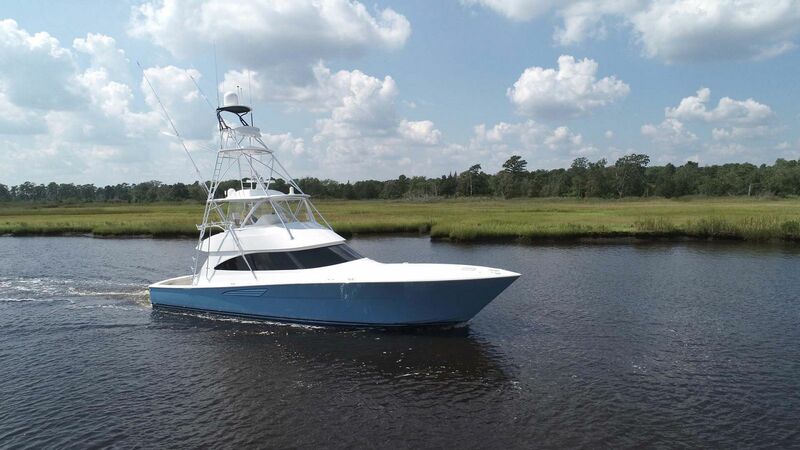 For more information on the Viking 58 Convertible or other Viking models, please contact us at (718) 984-7676.